When it came to attracting and managing new talent, the recruiting and staffing team within a corporation’s human resources department was once regarded as transactional, administrative, and not as effective as third party staffing companies because it was usually a fairly new introduction, and the staff often consisted of junior-level personnel. Over the last 15-20 years though, thanks to the professionalization of the “corporate talent acquisition” function, there have been dramatic changes in the way top employees are found through the use of technology, tools, sophisticated recruiting techniques, and the Internet media. 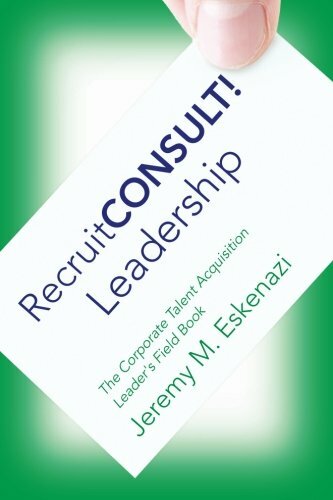 Unfortunately, however, the leader’s role within this function has failed to evolve at the same speed, which is why Jeremy Eskenazi wrote RecruitCONSULT! 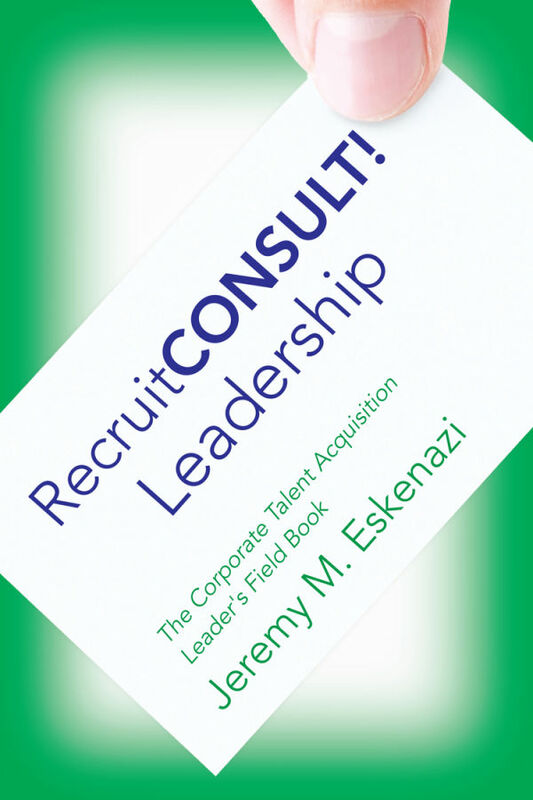 Leadership—The Corporate Talent Acquisition Leader’s Field Book, to help improve and optimize the way corporate talent acquisition professionals lead. In this frank, realistic, and forward-thinking field guide, readers will learn: Corporate Staffing leadership does not happen in a vacuum and relationships are key; regardless of budget, resources, or industry, there are always effective Corporate Staffing strategy solutions available; Corporate Staffing/Talent Acquisition leadership is an active process that must be focused; leading and managing Corporate Staffing is a distinct profession. Today, the position of recruiting leader has become significantly more complicated due to company globalization, and rather than administrators, corporations now look to employ true talent acquisition strategists who can drive competitive value for their organization and “win” through quality employees. While laying out strategic workforce plans for future development of staffing strategies, Eskenazi’s unique business approach introduces the benefits of transitioning to this new-age form of recruiting, and he hopes his readers will be relieved to discover that what could be very stressful has been diffused, broken down into solutions, and presented with humor. RecruitCONSULT! Leadership-- The Corporate Talent Acquisition Leader's Field Book, is the definitive guidebook for anyone who is leading (or wants to lead) a corporate recruiting and staffing function. Corporate recruiting and staffing expert, Jeremy Eskenazi, details many of the issues, concepts, and solutions to challenges a corporate recruiting and staffing leader may face including: Workforce Planning, Metrics & Economics, Building a Consultative Staffing Team, Leading a Proactive Staffing Function, Organizational Politics, The Power of Relationships, Change Management, and the Globalization of Recruiting.